Franklin Parrasch Gallery is pleased to present Wanda Koop: Reflect, its first exhibition of paintings by the Winnipeg-based artist. From spectral, eerily wrought landscapes to abstracted planes of lurid, layered pigment, the paintings in this show function together as a suite of color poems. Evoking the visual effects of shimmering reflections on bodies of water, Koop’s flattened washes appear as if the paint and its accompanying energy might be emerging from behind the canvas, pushing up against an unstable, dynamic surface. Connecting with the experience of one’s peaceful contemplation of a lake or a stream, these works invite a multileveled dialogue with beauty. Although Koop has, for decades, led and been actively involved in successful community arts initiatives for at-risk children and youth in her neighborhood, during the summer of 2018 she felt the need to seek solace within her own practice and in the natural world. TheReflect series embodies the artist’s refusal of her feelings of horror and hopelessness related to recent acts of violence towards women and girls in her city. Addressing the nebulous interface between nature and culture, Koop’s work often employs the familiar themes, tropes, and framing devices that landscape artists have developed over centuries, prompting the viewer to consider the ways in which contemporary technologies alter our perceptions of the visual realm. 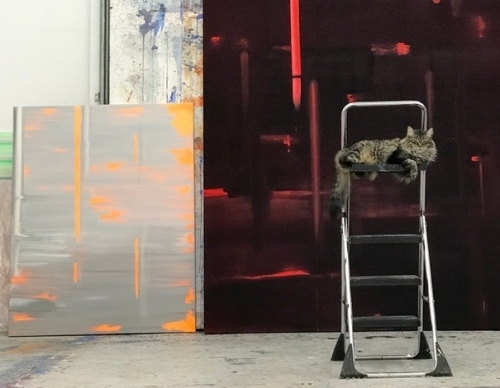 Koop positions her art between greater and lesser degrees of representation and abstraction, always with the frank acknowledgement that neither can be separated from the other. Still, her works’ relationship to color field abstraction is evident not just in their titling -- Blue Lavender, Mustard Yellow or Burnt Sienna, Deep Green, for example -- but in that their rich colors and quivering vertical and horizontal marks similarly grant the viewer a moment to be immersed in the visual and psychological experience of reflection. Wanda Koop (b. 1951, Vancouver) lives and works Winnipeg, Manitoba, where she has been based since early childhood. Her painting career spans four decades and includes a major survey mounted by the National Gallery of Canada in 2011. Koop has exhibited across Canada and the US, as well as in Europe, Asia, and South America. Recent solo shows include Night Gallery (Los Angeles), Division Gallery (Montreal), and Arsenal Contemporary (New York). Her work is held in such institutional collections as the National Gallery of Canada (Ottawa, ON), Musée d’Art Contemporain (Montreal, QC), Reykjavik Museum (Iceland), and Shanghai Museum of Modern Art (China), as well as the Bank of Montreal and the Royal Bank of Canada. Koop has been the recipient of numerous awards, honorary doctorates, and Canadian medals of honor, including the nation’s highest civilian honor, the Order of Canada (awarded in 2006). Her life and work was the subject of Katherine Knight’s 2011 documentary film KOOP. In 1998, Koop founded Art City, a storefront art center that brings together world-class contemporary visual artists and Winnipeg’s inner-city youth to explore the creative process. Wanda Koop: Reflect will be on view at Franklin Parrasch Gallery, 53 E 64th Street, New York, NY, from November 2—December 21, 2018. An opening reception for the artist will take place November 2 from 6-8pm. For images, biography, and further information, please contact the gallery at info@franklinparrasch.com or at 212-246-5360 during business hours: 10a-6p, Tuesday-Saturday.